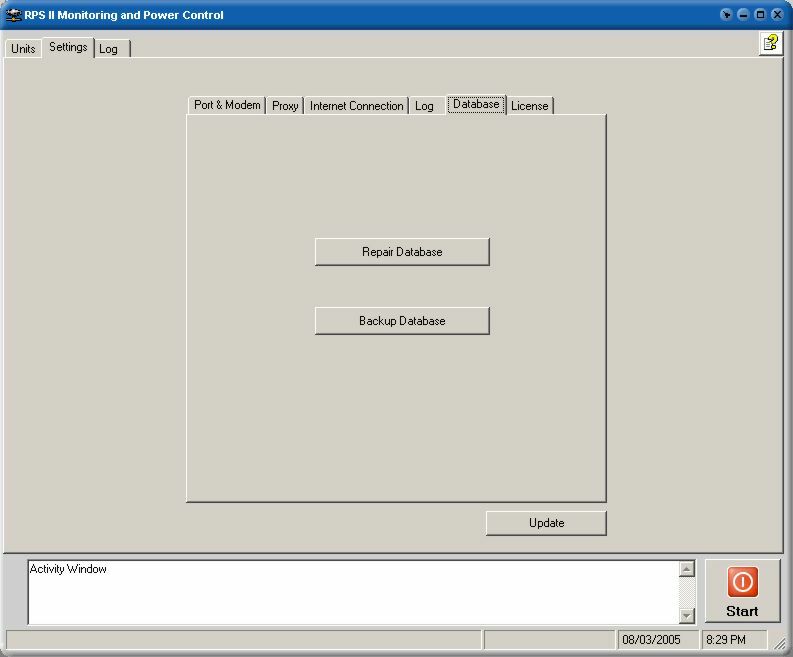 Modem Com Port – Select the Communications Port for your modem. Outside Line Prefix – If you are required to dial a prefix number to obtain an outside line, place this prefix number in this box. If you are required to enter 2 or more numbers, separate each digit with a comma to indicate one second delay before dialing the next digit. Several commas maybe placed in between digits if necessary. Example: 8,,1,, will give a 2 second delay in between dialing the digits to allow for telephone system delays. Tone Interval – This value is usually set to either 0 ( zero ) seconds or 1 second. It is the time in between command codes that is sent to the RPS device. The value has several determining factors including your modem, the quality of the phone line you are using and the telephone wiring configuration of the phone number you will be calling to connect to the RPS device. You must test these values to make sure the RPS device will respond as it should. 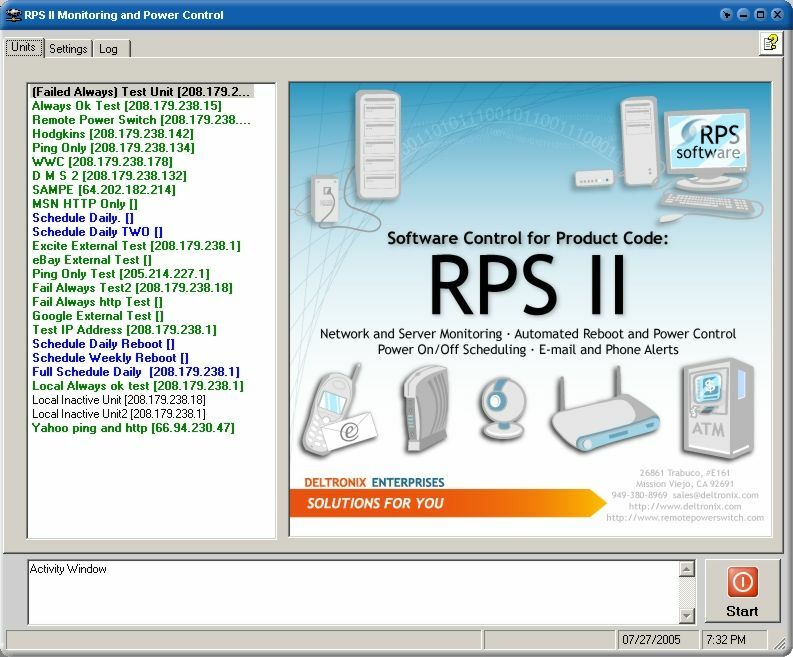 Check Dial Tone During Modem Test – As an additional check, the modem dial tone will be tested to be assured that an outgoing phone call can be made from the RPS Software. If a dial tone is not detected, during the modem periodic test of the software, you will be notified via email of the failure. Email Address if Modem Failure – This is the email address which will be notified if the modem fails any of the designated periodic tests that occur during program operation. Test – This tests for the presence of the modem, and a dial tone, if the above checkbox is selected. Proxy Address – Enter in the proxy address if you are using a proxy server. Proxy User Name – Enter your User Name if you are using a proxy server. 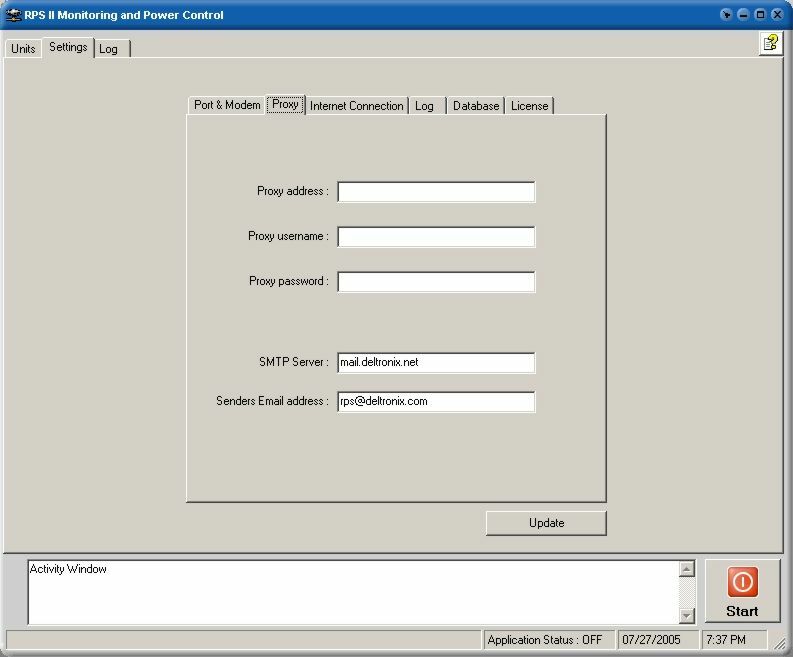 Proxy Password – Enter your Proxy Password if you are using a proxy server. SMTP Server – Enter your SMTP server for sending outgoing email. This address will be used by the program to send alert notifications. Make sure the mail server is configured to accept email from this workstation. 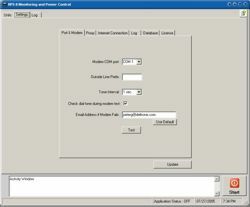 Senders Email Address – this is the email address that the program will use in the FROM field of the email message. URL for HTTP & Ping verification https:// – This setting is only available in the registered version of the program. The URL placed here will be used in the external verification checks conducted by the RPS program. If a failure of a device is detected, an external verification of failure can be requested on the device. If failure is confirmed, the software will carry out its designated instructions. If a ‘pass’ is received, the software will reset the failures as an OK and continue monitoring your devices. This option appears only if you have selected to purchased the external verification subscription. 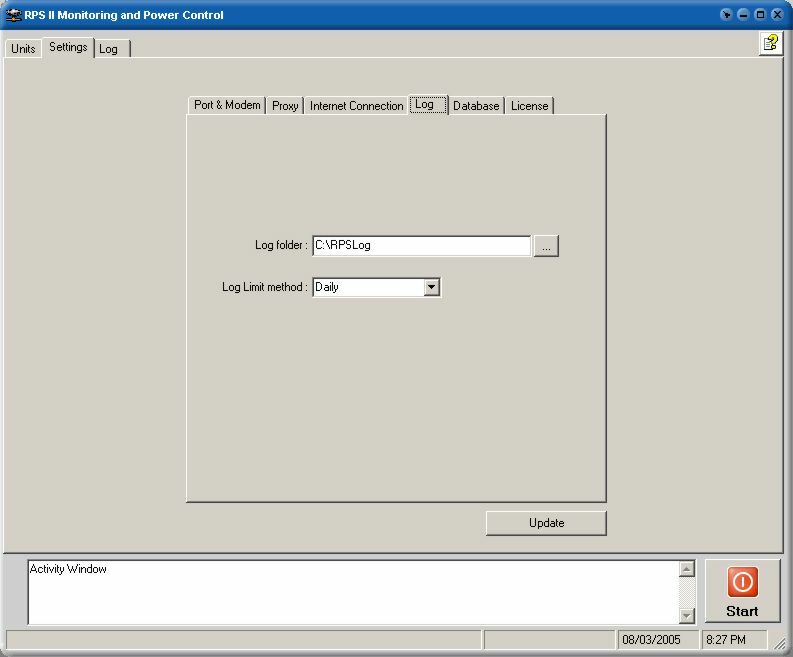 Internet Connection Test IP – Your RPS software monitors a local internet connection to be assured it has a gateway to monitor devices. It periodically checks this connection and if a failure occurs, stops all device testing and sends a telephone alert to the selected phone number. A series of telephone tones consisting of repeated 1-1-1-1-1-1-1-1 will indicate a failure. A series of tones consisting of 0-1-2-3-4-5-6-7-8-9 will indicate a pass condition. You may not want to monitor the IP address of the immediate gateway (your internet router) . Instead consider a router just outside your network on the internet depending on your overall configuration. Max. Internet Failure Count for Alert – This is the number of consecutive failures of your internet connection before a telephone alert will be initiated. As your network can have a ping failure for a number of reasons, 1 ping failure may not indicate a true alert condition. Here you can designate the number of consecutive failures before the alert process begins. Min Internet Test OK to Clear Alert – Once your Internet Connection failure occurs, it will have to pass this number of tests before it is deemed to be in a UP state. A phone alert will be sent when this number is met. Delay between Dialing and Message – When a internet connection failure or Ok telephone alert needs to be sent, the software will dial your designated number. This maybe either your cell phone or other telephone number. You need to adjust this value to allow for the number of rings before the alert phone picks up to answer. For instance, if you are calling a cell phone, after 5 rings the call is forwarded to voice mail. To ring the phone 5 times and wait for the voice mail message to end, the program may have to wait 20 seconds. If this is true, you need to place 20 into this box. After the 20 seconds occurs, tone notification will be made based on the details given in the Internet Test IP above. The presumption here is that the alert phone number will be ‘manned’ so the person receiving the call will know that if a call containing silence is received, followed by beeps, an alert is in progress. If the phone is not answered, and forwards to voice mail. A message consisting of the alert tones will be saved. 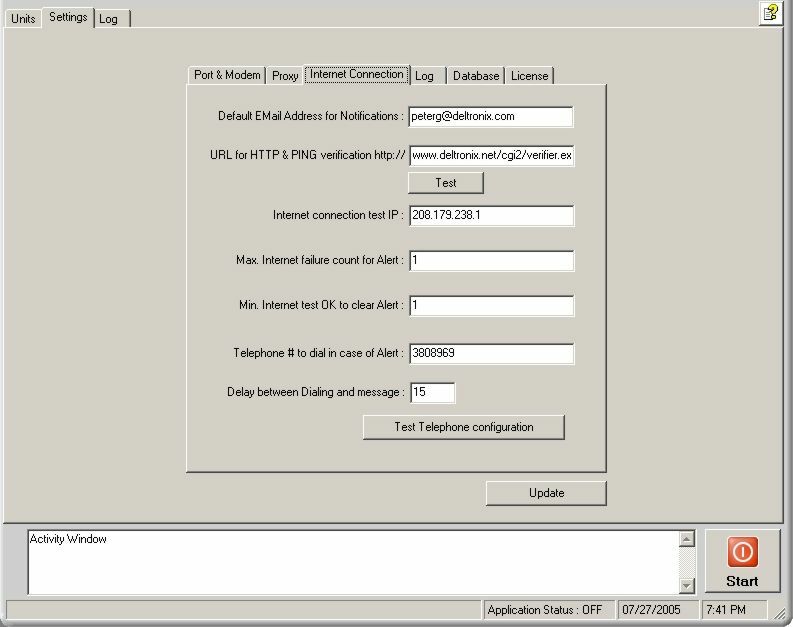 Test Telephone Configuration – Here you can test the actual alert configuration to make sure the program is properly setup to send a telephone alert to your designated phone number. Repair Database – In case of a database failure, you can click this button to initiate a repair. Backup Database – It is a good idea to periodically backup your RPS Software database of RPS Units to a backup directory for safekeeping. 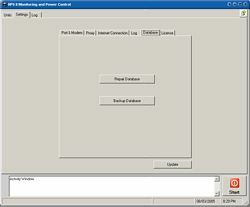 This page shows the licensing details and features enabled on your copy of the RPS Software.